The last Gourmet Magazine came today, and my husband is so traumatized that he can't even look at it for more than a few pages at a time. I find this remarkably odd. He never cooks. When I'm out of town he either eats cereal or toast or just has someone else make him dinner...at a restaurant. But something about Conde Nast's cancellation of Gourmet has completely unnerved him. I admit he liked to pour over every issue. It is--was--a pretty magazine. He'd spend time when it came, savoring whatever he savored and that was it. He rarely referred back to it or asked, three weeks later, for that rabbit cassoulet he read about. Nor does he like to travel. The magazine was a trove of travel ideas, what to see, what to eat, where to go. But he hates to leave his house. In fact, when he does travel, he takes his house with him...his RV is a dear friend. 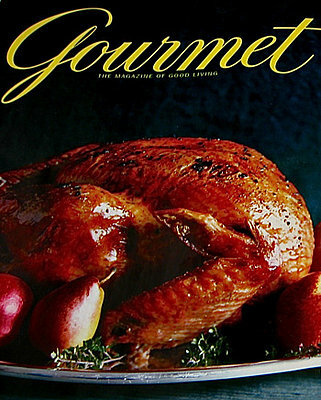 So I'm at a bit of a loss to understand why the demise of Gourmet has given him such a wallop. Too much a sign of the times? Perhaps. But I can't say he's one of those high life kind of guys. His favorite pastime is digging in the dirt. Seriously. One of his proudest (and, secretly, most enjoyable) achievements is the rain trench he dug around the shrub beds in the front and side of the house. When it rains he likes to go out on the porch and make sure those sunken alleyways are doing the job the way they were engineered to do. So it's not like he was managing a hedge fund or drinking Cristal and downing caviar while Rome burned. But Si Newhouse struck a nerve, I guess. God, it's a cold cruel world. This Sunday in the NY Times Magazine, Ruth Reichl, the editor--former editor--of Gourmet did the one-page interview. Asked to predict the fate of another Conde Nast publication, The New Yorker, Ruth predicted that magazine would be around forever. Evidently, Si "loves" that mag. Not my baby boy. He canceled our subscription to The New Yorker months ago. With Gourmet on the other hand, we had to wait to be dumped. That's us. Always right in front of the trend. I feel for your DH, Annie. I've been known to buy cookbooks, glance through them, decide the recipes are too much trouble and go back to cooking what I always cook. Yes, MN, but at least you cook! If you can call it cooking! I'm a Southern cook with Weight Watcher's influence. I'm set for cooking Thanksgiving dinner for five. Woe is me! I love seeing my family. But my sister and I are on W.W., her DH is an insulin dependent diabetic, my mother will be cataloguing every bite that goes in our mouths, and my son will pace himself because he'll have two dinners to eat. One will be dinner and one will be lunch. I'm tired just thinking about it. Poor you! I can't believe you will be doing this all by yourself. I'm dying to know what you'll be fixing. Maybe I'll do a post and see if people will contribute their holiday menus. Sounds like a good blog topic. I'll let you know when I've come up with a menu, but I doubt it will vary from what I always cook for Thanksgiving with lots of low fat substitutions. No one noticed last year that I cooked lean. I'll start preparing and planning the week before. Mom always makes the dressing--that's a given. I do everything else. Although mom said a magic word, "Cater." Something to think about. Yes, cater IS the magic word. But alas, it's never as good as homemade. And not nearly as low fat. On the other hand...well...less work more relaxing. Can't go wrong with that. I won't cater it. No, that was just mom's suggestion. I like to control what I'm putting into my body, and my substitutions are undetectable at least by my non-gourmet family members. I, like your husband, am heart broken. I can barely look at the last issue. However, I love to cook. I love to eat. I travel internationally every chance I get. Well, FT&B, I know you have plenty of company in your time of mourning. And with or without Gourmet, I hope you have plenty of wonderful places and recipes to explore.